Could Android save Microsoft's Surface? Fancy running Android apps on a Surface Pro? We've seen all kinds of wonderful Windows 8 tablets this month, but they all have one problem in common: apps. Some of the biggest names such as Facebook, Google and Twitter haven't bothered to publish Windows RT apps yet, and while the non-RT version of Windows can run legacy apps, pre-Windows 8 apps weren't designed for touch displays. That makes Windows tablets a tough sell, and Samsung for one reckons it's too tough: earlier today, it announced that it wasn't going to sell its Ativ S Windows RT tablet in the US. Speaking to CNet, Samsung blamed "the modest feedback that we got regarding how successful this could be at retail from our retail partners." 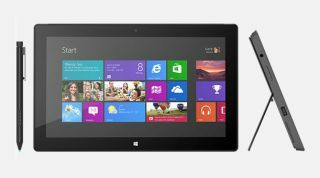 Other OEMs such as HP and Toshiba have delayed or cancelled their RT tablets too, and even Microsoft's Surface appears to be struggling to attract customers. Maybe the answer is Android. Imagine if every Windows 8 tablet could run Android apps - apps designed specifically for touchscreen devices, apps that don't require you to wait until the developers decide whether Windows is worth the effort, apps that aren't available in the Windows Store. Wouldn't that be great? Lenovo certainly thinks so: it's just signed a deal to put BlueStacks' Android emulator on around 40 million Windows machines - and it's not the only one, as BlueStacks has also signed deals with AMD and MSI. You can imagine Intel getting on board, too, as ARM emulation on Intel devices would harm ARM sales and help Intel ones. Should Microsoft embrace it too? BlueStacks has been around since last year as a Windows program, and it recently added a Mac version - but it's not hugely interesting on desktops, because apps made for touch screens aren't ideal on keyboard and mouse/trackpad-based systems. On tablets, though, it's a different story. In one fell swoop, a Windows 8 machine running BlueStacks has access to Android's touch-optimised apps. It's not perfect - it's a beta so of course it has bugs, there are malware concerns, and because apps are running in an emulation layer they can't integrate with Windows the way native apps can - but it does bridge the app gap on Windows 8, and BlueStacks is reportedly working on a Windows RT version too. Microsoft could stop that one - Windows RT apps have to go through Microsoft's Store - but that might be a mistake. As Steve Ballmer famously bellowed, it's all about DEVELOPERS! DEVELOPERS! DEVELOPERS! - and at the moment, touchscreen app developers are more interested in Android. Allowing Android apps on Windows RT gives those devices access to a quarter of a million apps - apps designed for the same kind of ARM-powered devices that run Windows RT. The danger, of course, is that BlueStacks could be the fox in the henhouse. If developers can get their apps onto Windows without having to code for Windows, why bother coding for Windows at all - and if the apps you come to rely upon are all Android, why not buy a Nexus, or a Transformer, or any other Android tablet? It's a risk, but then the status quo is risky too: developers won't code for platforms that don't have sufficient traction, and people don't invest in platforms if the apps they want aren't there. It'd be ironic if Windows RT's killer app turned out to be Android.